Provisioning and Service Quota has been available in ManageIQ/CloudForms for a long time. How Quota works is explained beautifully by Peter McGowan, however, quota only applies during initial provisioning. Enabling quota verification during VM reconfiguration would be really useful. Firstly, we need to invoke the Quota StateMachine during a VM reconfiguration request. This is done by adding a VmReconfigureRequest_starting instance in /System/Policy, with a Relationship to the existing StateMachine. Secondly, we need to modify Quota StateMachine request method, since the standard method isn't expecting the miq_request type of VmReconfigureRequest. Enable Quota for Group or Tenant as described by Peter and import the updated datastore. 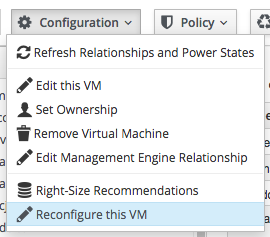 Request VM reconfiguration as usual and quota will be validated.